SO THIS IS A LIMITED EDITION CARD OF THIS CHARACTER. INCLUDES 10 COLLECTIBLE CARDS FEATURING EXCLUSIVE IMAGES FROM THE FILM'S TRAILER. SO THIS IS A LIMITED EDITION CARD OF THIS CHARACTER. 12 card - Solo character set. 100 Base cards feature characters, scenes and artwork from the upcoming film Solo: A Star Wars Story in theaters May 2018. Hand-drawn renderings of characters from Solo: A Star Wars Story. Featuring characters from Solo: A Star Wars Story. 1996 Genuine 23KT Gold Cards Graded Gem-Mint 10. Each card is Sculptured in Genuine 23KT Gold Leaf. STAR WARS . Must Have for Any Star Wars fan! Star Wars – New Hope Movie. Star Wars – Shadows of the Empire Movie. This includes all 22 Green Stickers from Series 3. You will receive all cards numbered 67 through 88 as you can view in the scan. The backs contain interesting movie facts as well as puzzle pieces. 1-2019 THE RISE OF SKYWALKER CARD SET (10-CARD SET). VERY LIMITED! This Sticker Set has the COMPLETE Set of All 66 DIFFERENT STICKERS / VARIATIONS. (A Red,Orange and Yellow Set of 33 Stickers AND a Green ,Blue and Purple Set of 33 Stickers ). These Stickers are Still in Their Original Mint State Condition. This auction is for any 9 cards from my Star Wars Card Trader account- your choice. I'm an active trader on SWCT and accept trades for any of my cards in exchange for any two inserts that I don't already have. I love giving back to the SWCT community by giving other traders the choice of trades! My collection is constantly changing, so no cards are guaranteed, even the ones pictured. Check out my account, Thundergirl to see what cards I have and feel free to send me a 2:1 trade even if you're not interested in bidding on any 9. May the force be with you! Buy With Confidence! These cards were only touched in order to put them together as sets and are in excellent condition! 2017 Topps Star Wars Journey To The Last Jedi 110 Card Red Parallel Set. Purchases / inquiries responded to quickly. This card is digital only and buyer must have the Topps Star Wars Card Trader App to purchase. When purchased, include your app username so that the transfer can be sent via in-app trade. You will not receive a physical item. Buy With Confidence! 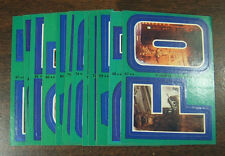 These stickers were only touched to be made into complete sets and are in excellent condition. 2”1$ Topps Star Wars Journey To The Last Jedi Complete Retro 18 Card Sticker Set. Give us a try & you be the judge. • PLUS 1:2 chance at Jedi Council Insert Card. Cards are in NM shape. 27 Cards per Set. • Complete Set of 25 Base. This was sold out in less than 30 minutes after the show opened and was lucky to pick up a few of these sets. 1996 Genuine 23KT Gold Cards Graded Gem-Mint 10. Each card is Sculptured in Genuine 23KT Gold Leaf. STAR WARS . Must Have for Any Star Wars fan! Set of 3 Gold Cards. The Cards are Over 20 Years Old! STAR WARS GALAXY 7. 110-CARD BASE SET. CARD #'s 1-110. NO RESERVE! IN-HAND "RETRO REWIND" 5 CARD SET. Note:This is a Promotional card for the Star Wars Celebration Chicago 2019. The three cards feature artwork from the mural that was unveiled at Star Wars Celebration. Each individual card size is 2.5" x 3.5" and together form a picture that is 7.5" x. 3.5. 1977 Topps Star Wars Series 1 Wax Pack sealed and also place in sealed plastic to preserve the package! Great condition! Shipped with USPS First Class Package. My SWCT account ID is AVENGER15. I have a collection of more than 55,000 Star Wars Card Trader DIGITAL cards. EVERYTHING must go: inserts, awards, base, base variants, gold — everything that is unlocked can be yours! 2016 TOPPS STAR WARS THE FORCE AWAKENS Series 2 COMPLETE SET 100 Cards sale!!! 2016 STAR WARS THE FORCE AWAKENS. STAR WARS THE FORCE AWAKENS CARDS. NEW RELEASE 03-24-2016. STAR WARS CARD TRADER APP. The set is case fresh, and in excellent to mint condition. The set contains 30 cards. GOOD LUCK! This will include cards Temporary Tattoos 1-10. 1-100 of the base set. Card art by Joe Corroney & Brian Miller. All cards are in Near Mint condition! Personas Of Star Wars - Wave 2 Card 1 - Anakin Skywalker - Blue Variant. These are NOT physical cards. 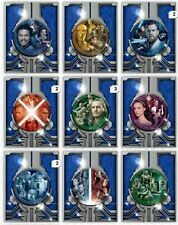 You MUST have the Star Wars Card Trader app installed in order to receive this item. This item is a digital card. You are buying the 25-card base set - no auto, parallel, or insert. 19- L3-37– Solo: A Star Wars Story. 21- Qi’ra – Solo: A Star Wars Story. 24- Val – Solo: A Star Wars Story. 12- Aunt Z– Star Wars Resistance. WAVE 2 - GREEN VARIANTS. 2018 Star Wars Topps Finest Anakin Skywalker Lightsaber Hilt Medallion Gold Refractor card #/50 From pack to top loader. I combine shipping .50 for each additional card so check out my other listings! I’ll send combined invoices after that day’s auctions end. Shipped very securely and with USPS First Class Packaging with tracking. Thanks very much! Set:Star Wars Celebration Chicago 2019. Note:This is a Promotional card for the Star Wars Celebration Chicago 2019. Card #:NNo. 2018 Star Wars Topps Finest Obi-Wan Kenobi Lightsaber Hilt Medallion Green Refractor card #/99 From pack to top loader. I combine shipping .50 for each additional card so check out my other listings! I’ll send combined invoices after that day’s auctions end. Shipped very securely and with USPS First Class Packaging with tracking. Thanks very much! This is for 2019 Stranger Things season 2 base set and character sticker set. Character sticker set 1-20. Base set 1-100. I scanned card # 1 only but it is for the whole set. (US only on this set).